That doesn’t mean that the ISP is now in the clear. Cox is also caught up in another lawsuit filed by a group of major music labels, all members of the RIAA. 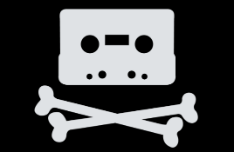 The labels argue that Cox categorically failed to terminate repeat copyright infringers and that it substantially profited from this ongoing ‘piracy’ activity. All at the expense of the record labels and other rightsholders. This week Cox submitted a reply to the complaint, denying all these allegations. It requests a declaratory judgment from the court stating that it’s not liable for any copyright infringements carried out by its customers. The record labels are unlikely to refute any of the above. The real dispute, however, is about whether Cox should have terminated customers for whom it received many notices. The labels previously argued that 20,000 Cox subscribers can be categorized as blatant repeat infringers, some of whom have been ‘warned’ more than 100 times. Writing to the court, the ISP counters that these notices could not be trusted or easily verified. 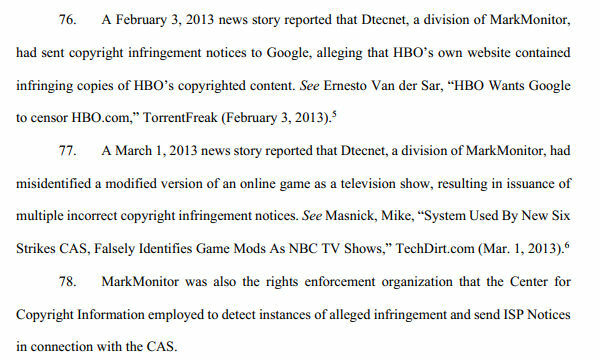 “Indeed, studies and published reports show that such notices can be wildly inaccurate,” Cox writes, pointing to an academic report as well as a TorrentFreak article which shows how HBO targeted its own website. This critique on the accuracy of DMCA notices is not new. It has repeatedly been highlighted in similar cases. Perhaps more novel is Cox’s mention of the “six strikes” Copyright Alert System. This was a partnership between US ISPs and copyright holders, including many of the labels, to forward infringing notices to pirating customers. This groundbreaking deal set a limit on the number of copyright notices ISPs had to process. Perhaps more crucially, it didn’t require the companies to terminate repeat infringers, even after 100+ warnings. This is an interesting ‘double standard’ angle, as the labels now accuse Cox of failing to terminate repeat infringers, something that was never a requirement under the Copyright Alert System. This deal (which Cox wasn’t part of) was still active during the time period that’s covered by the lawsuit, and apparently, the RIAA was pretty happy with it at the time. “In May 2014, RIAA Chairman and CEO Cary Sherman described the Center for Copyright Information as ‘a model for success,’ Cox writes, adding that he lauded program and all its accomplishments. 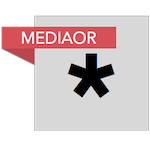 Fast forward a few years and now ISPs are being sued for adhering to the same standard as set out in the groundbreaking Copyright Alert System. Based on these and other arguments, Cox requests a declaratory judgment stating that it’s not liable for contributory infringement, and another declaratory judgment clarifying that it’s not vicariously liable for pirating subscribers. A copy of Cox recent filing is available here (pdf).